DC’s 4th Annual Meat-Free Week, sponsored by DCVegan, Compassion Over Killing and The Kindness Collective, starts on Monday. With barbecue, slaw, collards, cornbread, and cupcakes. After our fabulous time at their Summer Supper Club, we’re excited to see another dinner event. The menu features soup, flautas and a tres leches cake that people are still talking about from last year. If you’re looking to splurge, reserve a $60 seat at this pop-up restaurant/art gallery. The donation includes a cocktail and $15 Uber credit to get you home, and proceeds go to The Kindness Collective and Compassion Over Killing. The menu includes burnt broccoli bisque, tagliatelle with mushrooms, and Goûter’s own chocolates. Few seats are left so get on it if you’re interested! Specials will include sloppy joes, meatball sandwiches, and burritos. Happy hour starts at 5 and will feature $2 off vegan entrees. Many of these meals along with other specials at Science Club, Fusion and Souper Girl will be happening all week. Check the site for a full schedule and updates, and let us know how Meat-Free Week treats you! VegFest, DC’s annual free vegan extravaganza of vendors, exhibitors, speakers and activities, is coming up on Saturday, September 22nd at Yards Park. This year’s event promises to be even bigger than last year’s success, when nearly 1000 people lined up within the first hour to try and score free coveted goody bags. The focus is definitely on the food at VegFest. What better way to promote veganism than to stuff people with tasty meat-free fare? Dozens of commercial vendors will be out to promote their goods with samples and coupons, including Daiya, Earth Balance, Izze, Pasta Valente (vegan alfredo sauce! yum!) and Soyummi. Several food vendors will also be on hand, including local staples like Sticky Fingers Bakery, Bakeshop, Amsterdam Falafel and Everlasting Life Cafe, but also Vegan Treats from Philadelphia and DC’s Bread and Brew, which is co-sponsoring the event and appears to be promoting its vegan offerings. Plus, the presence of Loving Hut, which will save you a trek to Falls Church, is reason enough to stop by! Talks and activities should keep you busy in between bites. The speaker list includes Terry Hope Romero, author of The Ultimate Vegan Cookbook and Vegan Cupcakes Take Over the World, Afya Ibomu, who wrote Vegan Soulfood Guide to the Galaxy, (I loooooove that vegan soul food has Officially Arrived!) and DC’s own Cupcake Wars winning Doron Petersan of Sticky Fingers Bakery. Contests and cooking demos will also be taking place all day – a cupcake eating contest and a demonstration by Oprah’s chef Tal Ronnen were highlights from last year. The 2012 DC VegFest marks the 4th year of a collaboration between co-organizers Compassion Over Killing and the Vegetarian Society of DC. Check the VegFest website for updates to the vendor list and schedule. UPDATE: VegFest will have its first ever beer and wine garden, courtesy of Bread and Brew! The Foggy Bottom location of Whole Foods hosts free monthly cooking classes, taught by Rachel Morris of www.thesinglebite.com. It looks like the focus is on simple, one-person meals that can be prepared vegetarian or vegan. Today’s class will feature an avocado bean salsa and vegan BLT. We’ll stay tuned to future offerings and let you know if we check it out! Tonight’s ‘Italianish’ themed dinner with tomato and peach bruschetta, handmade pasta and tiramisu is nearly sold out so call now if you still want a spot. Wednesday the 22nd will be raw and August 29 will be Mediterranean – we’re looking forward to that one! 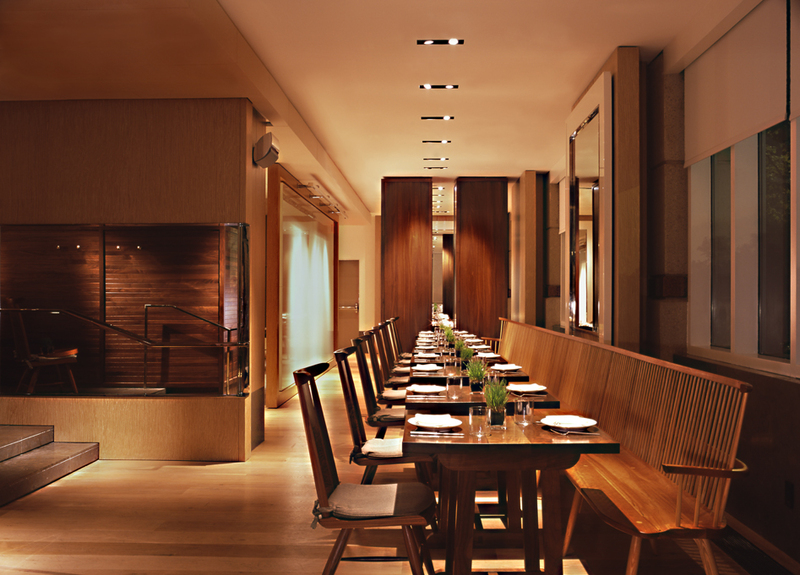 There are two seatings for each dinner, at 6:45 and 8 pm at $28/person. For reservations and details visit the Sticky Fingers website. Been to one of the dinners? Tell us what you thought! UPDATE August 27: Looks like August 29’s dinner has been postponed until October 3rd. Call to reschedule your reservation! The folks at the Blue Duck Tavern have graciously provided dcvegetarian with a sample of their new special vegetarian and vegan menu. As you can see, they have clearly made an effort to include a variety of appealing vegetarian options, and we appreciate having a clear list of what’s vegan and what’s vegetarian. Ah, how nice it will be not to have to ask before ordering! 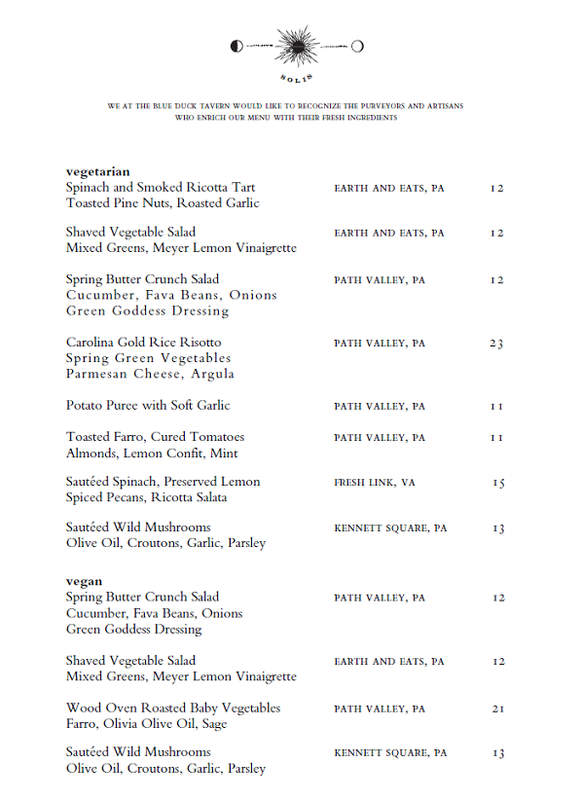 So ask for the vegan/vegetarian menu at Blue Duck Tavern, and tell them we sent you! We’d love to hear what you think.